PE - Our PE is on Monday and Friday. Please make sure that your child has a suitable PE kit to use. They will need both an indoor and outdoor kit. Reading - All children will now have a reading book from the library. They can login to the website below to take the vocabulary and comprehension quiz on their chosen book. The children will have their login details in their reading records. As we are a class that loves reading, it is encourage that children bring in their own books in to school from home to read, and to share with the class at the end of the day. 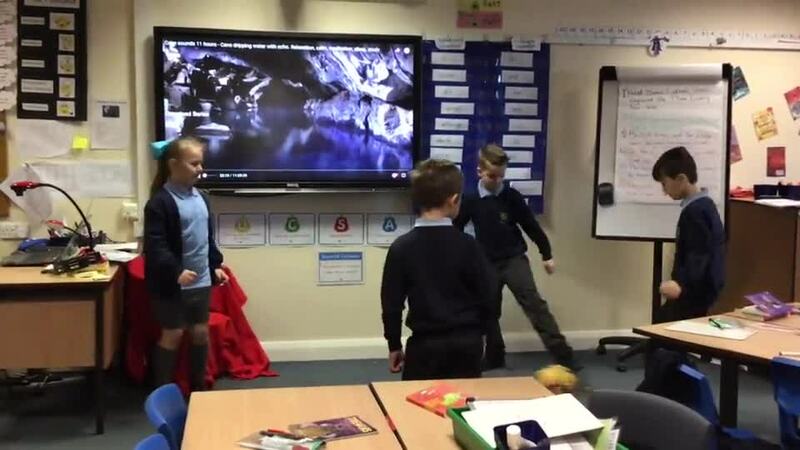 Keep checking this page to find out what wonderful things Werewolf class get up to! We have finished our unit of work focussing on caves. We planned our final piece and on Friday finished our final piece of writing. Our writing was a description describing the inside of a cave. The children should have made the reader feel like they were inside of the cave by using adjectives to build the atmosphere. This week we have started our journey as news reporters. We have started writing our news reports of the Thailand cave disaster and produced some brilliant work. By next week, we will have our own Werewolf newspaper with all of our news reports inside! We have been creating an instruction manual on how to make a Christmas card. We included all of the key features that instructional writing needs, including; title, sub-headings, equipment list, steps and a closing statement. After we finish off writing our instruction list up, we are going to swap manuals with Pegasus class and have a go at following each others instructions to try and create the cards! We have started looking at instructions in our English work. We followed some instructions to make a Christmas card where we painted our feet and stood on the card (or in a lot of cases the classroom floor!). We looked at the key features of instruction writing and started planning an instruction manual on creating our own Christmas card. We carried on our work with Mr Wonka being kin enough to stay around and teach us. We carried on dissecting the Augustus Gloop scene, and moved on to dissecting the Veruca Salt scene to pinch ideas from to create our own story. Mr Edwards kindly shared with us his own Charlie and the Chocolate Factory piece of writing where he went on an adventure himself. We looked at the key features of the text and underlined them in different colours. A big well done Werewolves keep it up! We have had an AMAZING week in literacy! We had a visit from Willy Wonka himself (Mr Simmons :D) to introduce our theme of Charlie and the Chocolate Factory. We have deconstructed the text and really thought about the characters in the Augustus Gloop scene and used inference to look at their traits and feelings. We have continued looking at 'The Lighthouse' story and thought about the emotions of the lighthouse keeper when he disturbed when completing his week. Mr Simmons produced an Oscar winning performance when pretending to be the lighthouse keeper, displaying how the lighthouse keeper felt when hearing the noisy villages. We then created letters trying to persuade the mayor to quieten the noisy villagers down. We have been looking at 'The Lighthouse' story which hooked the pupils straight in. We stopped the video during the dilemma where the lighthouse keepers' light broke with a ship incoming. The children had to predict and write the ending to their story using their creative minds to create whatever ending they wanted. Pupils were encouraged to use adjectives and expanded noun phrases (ask them what they are, they should be experts!) and produced some brilliant endings. We have been looking at more and less than a number. We have carried out lots of practical activities to help us understand which place value changes when we add 10 or 100 to a number or takeaway 10 or a 100. We ended the week looking at roman numerals and carrying out more or less tasks using these symbols. After our week of learning the time, we have moved on to money. We have recognised money including all of the coins and notes (so they should be able to do the shopping for you!). We have added and subtracted amounts of money including decimal places. We solved lots of word problems which involved using money. We have been looking at learning the time. We started looking at analogue clocks learning o'clock, quarter past, half past, quarter to and to 5 minutes. We then looked at digital clocks and realised that this is the type of clocks that we see more in everyday life. By the end of the week we were more confident at converting times between digital and analogue and worked together in teams to organise a range of times. This week we have been practising our addition skills using the column method. We worked extra hard on our presentation to ensure that our digits were in the correct place value column so our answers were correct. We have been fantastic and tried extremely hard on a very difficult technique. We have been looking at equivalent fractions this week in maths. We found out that even if the fraction has different numbers in it, it can still be the same fraction. We ordered and compared fractions based on what we knew (whatever you do to the numerator, you do to the denominator!). We are moving on to adding and subtracting next week therefore completing the homework that has been set will give you a big head start! We have carried on our work around shape and progressed on to looking at the different angles. We first of all identified right angles and discovered they were 90 degrees. We compared angles to right angles and checked if they were bigger or smaller. We named the smaller angels acute angles and bigger angles obtuse angles. We had a very fun activity outside working in partners. One person was the leader who had to lead the puppet around the playground using only mathematical terms such as; turn 90 degrees clockwise, turn 90 degrees anti-clockwise, walk forwards, turn around 180 degrees. Our focus for the week has been shapes. We have looked at 2D and 3D shapes and the properties of each shape. Ask your children the difference between a 2D and 3D shape and they should be able to tell you! We also looked at the nets of a shape and predicted what shape the net would make. We made the nets into the shapes and saw if our prediction was right or not. We have been looking at different representations of numbers including the numeral, word and visual forms. We loved playing the 4 corners game working out the answer to the question and standing in the corner where the answer was. We looked at roman numerals and converted the roman numerals to numbers, and vide versa turning numbers into roman numerals. We have been looking at place value and the value of digits within a number. The pupils have worked extremely hard at learning the value of numbers (which are the biggest and which are the smallest), placing numbers in ascending and descending order, more than and less than signs and knowing the place value of numbers up to 5 digits! This week was our final week on our topic the Stone Age. We finished off our Stone Age houses making sure we thought about the intricate finishes we wanted. We evaluated our models and thought about the challenges we faced and what we could improve if we were to do them again. On the Wednesday, we held our very own Stone Age day! This day was a huge success where we lived like Stone Age people for a day, including dressing up, making jewellery, drawing cave paintings and many more activities. Lots of parents and adults attended our workshop where we showed off our amazing work, and even let them taste our very own stew! There are lots of pictures above for you to enjoy. This week we looked at the settlements that people lived in during the Stone Age. We looked at what sort of activities the stone people got up to, what they wore and what they eat. We focused on Skara Brae which is believed to be a place where the Stone Age people lived. We imagined that we lived at Skara Brae during the Stone Age and wrote a diary entry of what a day would have been like. We have been learning about the stone age and looked at the different objects that they used to make out of stone. We had a special letter from the National History Museum stating that they had lost a spear and other artefacts. We went on a treasure hunt around the school to find the missing spear! We looked at states of matter this week and found out that there were 3 different states; liquids, gas and solids. We looked at the different things we can do to identify which state something is, looking at things like 'does it pour' and 'does it fill the whole container'. We watched a very cool experiment on youtube by Science Max looking at how certain things can change from solids to liquids. We found that mixing corn starch and water together formed a substance that was both a solid and a liquid! We also started to get into the Christmas spirit by creating a Christmas card which we are going to send to the residents of Mapplewell Manor. We started looking at the water cycle in our Geography lesson and looked at the journey that it goes on. We found it amazing that the water cycle is never ending and the water we drink has been around since the earth began! During our topic lessons, we looked at the journey of the cocoa bean. We found it where it come from (test the children!) and what happens to the cocoa bean after ready for our chocolate education day the following day. Our chocolate education day was brilliant and we learnt everything there is to know about chocolate! We even had a go at making our own chocolate pizzas which we eat on Friday morning, they were delicious! All the photos from the day are above. We started our brand new topic this week... Chocolate! We started by looking at the timeline of chocolate and how it has evolved over time. The children sequenced the historic events in their groups, and wrote a paragraph explaining the history of chocolate. For the first week back we have had a special week in topic remembering and commemorating everyone involved in the world wars. We looked at different war poems, and in particularly, 'In Flanders Fields'. We created our own recruitment posters using quotes and symbols from the poem. We created war poetry in the style of acrostic and made our own poppies to put up on our display in school. This week we have looked at the different layers of a rainforest. We discovered that there are 4 layers; emergent layer, canopy layer, understory layer, forest floor. We researched the different features of each layer and the animals that lived there. We created lots of different items that are displayed on our topic board. After our introductory week during transition, we already had lots of knowledge about rainforests and what live there. This week we located areas of the world where there are rainforests, and discovered that they were mainly near the equator. We watched a video all about rainforests and started to make an information sheet with lots of information about information from where they are, to what lived there.